A new prize claim system has been developed. Currently this system only works for the new FlipToWin mini game, however it will be implemented to most aspects of the site eventually. This includes Auction House, Pandora's Game, Gift Coin Wheel and anything else new added that requires delivering items to your characters. This system allows you to select items that you have won from the game and choose which character to transfer it to. You can also alternatively choose to delete the items if its something you don’t want and don’t want to bulk up your character’s inventories. 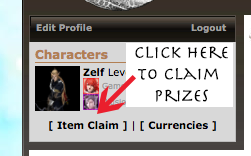 You can get to the prize claim page by going to https://www.l15server.com/claim/ or clicking in your profile window in the upper left of any normal L1.5 page as seen in the picture below. A new currency system has been added to manage giftcoins for site based features. 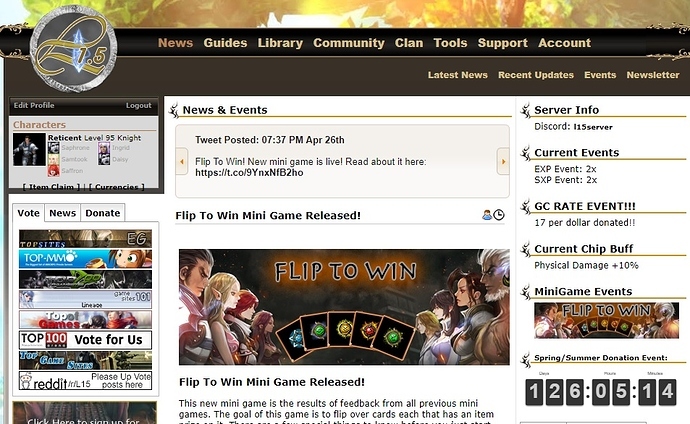 Currently it is only used for the new FlipToWIn game, however it will also be implemented into the other site features eventually. -site deposit x : this command takes giftcoins from your inventory and stores them to the site currency system. X in this case is the number of giftcoins you wish to deposit. -delete : This toggles on delete mode. After you use this command you can delete any item from your inventory that is not sealed. This makes things work as they always have deletetion wise. -nodelete : This toggles off delete mode. You will not be able to delete anything after using this command until you use the -delete command again. It is by default enabled. Flip To Win Mini Game Released! In my version of Firefox, the Vote/News/Donate tabs cover up the Item Claim and Currency links. The Currency link doesn’t seem to work either. Currency link doesn’t work either. 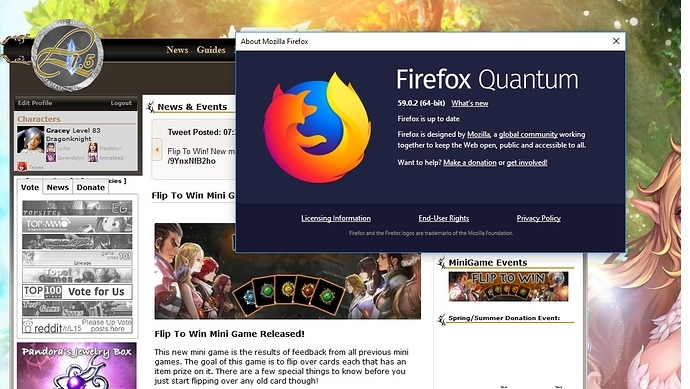 What version of firefox is that? The most updated version of firefox it looks exactly the same as chrome and the screenshot above for me. The currencies page is not done, correct. But you said that the vote/News/Donate tabs cover up the links, they shouldn’t. Well, on my version 59.0.2 (64-bit), it is covered up. Not sure what else to say. Google it is lower and kinda hard to see but not covered by the tabs like Firefox. I’ll consider what I can do to fix that, but it’s really hard if I can’t duplicate it. I’ve tested it on firefox and chrome latest versions on both pc and mac and it looks as it should. Can you provide a screenshot of it messed up? Sweet! Thanks for looking at it. I believe it should be fixed now. I just have it hiding the last character. Let me know if it looks clean like the original screenshot I posted. Much better. Although viewable on google chrome, it is kinda between tabs and box of players. FF looks good.